Do you want to offer hours of fun and entertainment to kids? Do you want kids to improve their hands and eye coordination in growing up years? Then you should order these custom paddle balls which will meet your requirements and keep kids happy. These paddle balls are fun promotional items to market your sports good stores, wellness business, kid's stores, summer camps and the like. We stock a thoughtful selection of custom printed paddle balls which will add some fun to your promotions without draining your savings. 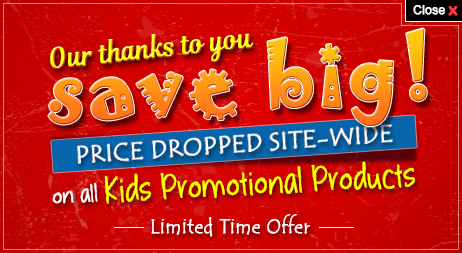 You can shop today at Promo4kids.com to avail the best price benefits and deals that are so unique to us. All our promotional giveaways for kids are covered with lowest price match guarantee and customer satisfaction guarantee. We offer great discounts on wholesale orders. Free online design proof and free artwork assistance are offered on all orders! Do you know the paddle ball have been around since the 1920's and it was always an American favorite! Today, it has evolved as the Wall Ball game of Paddle Ball, Racquet Balls, Four Wall in the Gym as well as Kadimah on the Beach. Can you avoid a promotional product which gives so much fun to users? You can print these paddles with your company logo or details of your upcoming company event, beach event, family reunion and beach wedding as an invitation. This trend of customized paddle ball gifts is catching with American entrepreneurs and organizations. This time you can try it at extremely low prices with Promo4kids.com. You can add your brand logo, design, name and photo or event details on these paddle balls and give the best shot. If you browse through Promo4kids.com, you will find lots of promotional giveaways for kids that are indirectly targeted towards parents. 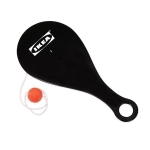 However, personalized paddle balls are items that are enjoyed by kids and parents alike. 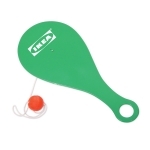 Each paddle ball set comes with two wooden paddles and a ball and they will hook kids and grownups for hours. Kids can enjoy their games at the backyard, on the beach and every time they play with it your brand logo will attract attention. If you are looking for a promotional giveaway to boost your campaign this summer, there is no doubt, that these promotional paddle balls will become your best companions. If you don't want to give it freely, you can organize a friendly paddle ball match in the area where your business is located and people will thank for making their leisure hours enjoyable. 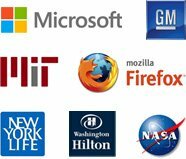 Just imagine the exposure that your brand logo will get when kids play with their parents and friends. 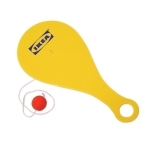 Hugely popular with kids, we stock only CPSIA compliant paddle ball sets, which are perfect for kids. 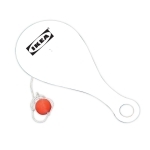 Available in a plethora of colors, these paddle balls will keep your young recipients happy and engaged for a couple of hours! Our team of promotional experts is ready to help you with customization, give you the best prices and other details about custom printed paddle balls. You can reach out to us at 855-454-3786 from Monday through Friday (8AM - 6PM EST). Alternatively, you can write to us at info@promo4kids.com.